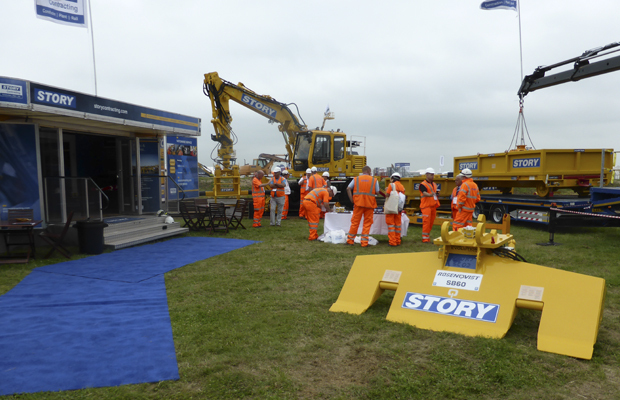 Story’s Plant Division exhibited at the Rail Live the National Track Plant Exhibition, one of the largest outdoor rail events in the UK. The two day event, held at Long Marsden in Warwickshire was the second held by Network Rail, the Rail Alliance and Rail Media Group. Over 20 companies exhibited from supply chain products to various services across the industry demonstrating innovations on track, electrification, asset management services, signalling and telecoms. The two day event at Long Marsden in Warwickshire saw suppliers from all aspects of the infrastructure business come together to learn more about how to drive efficiencies, breed quality and build upon reliability in their businesses. “We were thrilled at the overall feeling of positivity that is out there in the industry at the moment and the interest we received in our capabilities, machinery and the Story team was fantastic.